Moss green, a dark, yellow-green color, can warm up a cool room when you cover your walls with it. Soft blue is a striking complement to moss green, when decorating your home, because these two colors exist together in nature, such as the sky and forest. When mixing colors to make moss green or any color, a color chart comes in handy, showing you exactly which colors and what amounts to use for a particular result. 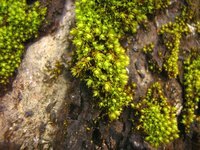 Mix food coloring to make moss green for realistic appearing leaves on a cake, for example, or combine oil paints to create moss green nature scenes on canvas. Add yellow to green paint to warm it up, creating a moss green for the walls of your home. In this way, you change the hue of the green to a warmer shade. Practice making the moss green in a separate, small container rather than mixing a full batch. Add a little more yellow or green to get it just right. Stir the paint well to get the full color. Using pen and paper, keep track of the proportions of yellow and green, in case you need to reproduce the exact shade. Collect 12 ounces of mullein leaves and flowers from the wild to make a natural moss green dye for clothing. Mullein plants grow two to seven feet tall, with yellow flowers in close clusters and thick, large leaves with a velvety texture. Tear the mullein plants apart and put them in a net bag. Fill a large pot with water, then add the net bag containing the plants. Simmer the plants for 30 minutes to one hour. Remove the net bag and use the dye to color fabric or yarn moss green. Mix thalo green with colors such as raw sienna, yellow ochre, burnt sienna or burnt umber, if you want a dull yellow green such as moss green, according to the late Helen Van Wyk, artist and former host of PBS Television's "Welcome to my Studio." Place the paint into small jars with lids until you are ready to use them on your canvas. Mix two parts violet color food coloring with three parts lemon yellow. This combination produces a moss green color which you can use to make icing for cake. Combine red and blue food coloring if you do not have a violet color among the food coloring choices. Red and blue makes violet or purple. Add orange one drop at a time if you have a leaf green color. A little orange dulls the green, turning it into moss green. Using eydroppers, combine six parts cyan ink, six parts yellow and one part black ink into a small jar to get moss green. Cyan looks like a blue-green or teal color. Add more yellow ink and less cyan to experiment with the intensity of moss green. Use your moss green ink for pen and ink drawings or to fill a fountain pen. Purchase mullein plants in health food stores or on-line as an alternative to collecting these plants in the wild. You can buy mullein flowers and leaves in bulk.